Rent Roll Archives - Real Property Metrics, Inc.
One of the biggest issues when calculating step rents in the Commercial model is that the model assumes that all rent steps occur at year-end. If a rental rate changes mid-year users had to manually calculate a blended rate for that year and enter it into the rent roll growth area. 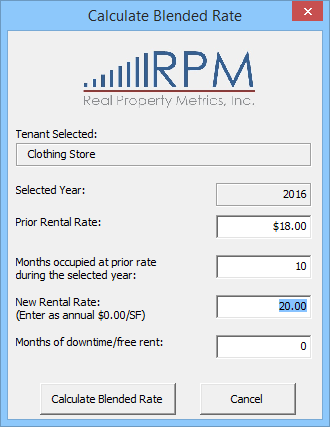 RPM is excited to introduce a new tool to easily calculate blended rates for step rents. You will notice on the Rent Roll tab of the Commercial and mixed-use models that there is a new orange button above the rent growth section. 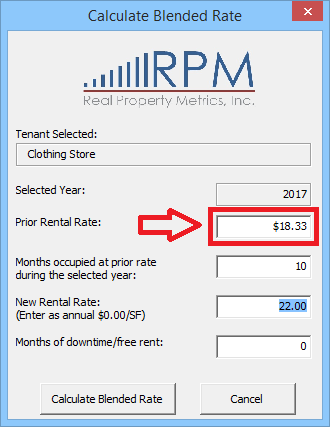 To create a blended rental rate in a give year, select the cell for the year that the particular rent will be increasing and click the new orange button. You will be asked to enter a new rental rate and any associated downtime/free rent. It will then calculate the blended rental rate for that year along with the next year based on rent growth from column “M” (if any). This should make Step Rent scenarios much more simple to calculate. You will then be asked to confirm the new blended rate before it is applied. 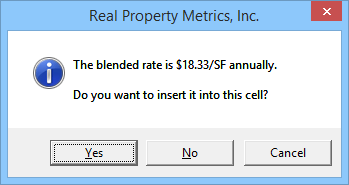 The way this new feature works is that it uses the rate in the prior year to create a blended rate in the current year. It then goes forward and inputs the new rental rate in the next year. This works very well for tenants whose step rents are spaced more than one year apart because there will always be a full year at the new contract rate which the model will use for the next blended rate. However for tenants with annual step rents you will notice that in the second step the model will attempt to use the prior blended rate as the prior rental rate. Be sure to change the Prior Rental Rate to the full annual rent rate for the prior year. We hope this new feature is helpful to you and look forward to hearing your feedback. This entry was posted in Commercial Model and tagged Rent Roll on February 9, 2015 by blake.